The Bank rate is the rate at which the central bank rediscounts papers presented by the commercial banks or makes advances to them directly against approved securities. Bank rate policy seeks to affect both the cost & the availability of credit. 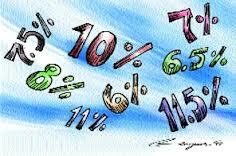 Cost is determined by the discount rate charged on borrowings of commercial banks from the central bank. The availability depends largely upon the statutory requirements regarding the eligibility of bills of rediscounting & securities as collateral for advances & also the maximum period for which the credit is available. If there is a tendency towards inflation in the economy, bank rate could be raised in order to make borrowing from the banks dearer. This would reduce somewhat the demand of businessman or bank advances. Since some forms of economic activities which previously were profitable would no longer be so. In the opposite case, when production required to be stimulated bank rate is reduced in order to make borrowing cheaper. This would increase the demand for bank loans, for some kinds of activity which were unprofitable when the rate of interest was higher could be profitably under taken. The Radcliff committee in Great Britain analyzed two types of effect which the movement of interest rates could create. These are the incentive effect and general liquidity effect. The interest incentive effect Refers to a change in interest rates ,thereby including a change in the incentive to business firms ,government bodies and consumers to purchase capital goods and stocks of commodities, and so cause a change in actual spending on labor and other factor of production .theoretically speaking, a change in interest rates represents a change in the cost of money and may , therefore ,have some effect on the incentive to invest in other fixed capital or in stocks of commodities. On the practical side, the Radcliff committee did not find any convincing evidence of the presence of interest incentive effect in recent years. The witnesses who appeared before the committee expressed the view that changes in the interest rates or cost money were insignificant in comparison with the other costs of production ,often particularly in relation to the element of risk in an undertaking . The cost of money was so small in relation to other costs & risks involved in the case not only of fixed investment but even of holding stocks of commodities that the changes in the interest rates were an unimportant factor to make the merchants & investors to change their plans. The nationalized industries also reported that their capital development had been often by the availability of material or the availability of labor, by administrative decision but not by the rate of interest. The committee also pointed out how “taxation in effect halves the interest cost.” However there are some “expectations” when changes in the rate of interest did have some influence, especially when they were working on narrow margins. The committee came to the conclusion in regard to the interest – incentive effects that while the effects were there & real, they were not on a large & substantial scale. The significance of interest rates lies not in the interest rate as a cost to the borrowers, or as inducement to the saver, but rather as a reflection of underlying changes in the supply of credit. Thus taking separately, general liquidity effect has more weight than the interest – incentive effect. But when both were taken together, the Radcliff committee reached the conclusion that while the pressure of interest, particularly if spread through the whole structure from short term to long term rates, was real, it was also gradual & not very large. It is mainly as a psychological weapon that Bank rate exercise its influence. Bank rate policy can’t be effective in bringing about an expansion of credit or controlling deflation. The absence of any kind of conventional relationship between the central bank & other components of money market further adds to the ineffectiveness of the bank rate policy. Under developed bill markets set a very serious limitation on bank rate operation. In the under developed money markets currency is more important than bank deposits, so even when the central bank is able to control the volume of commercial bank credit, it leaves mostly out of control the more important section of money supply. In the absence of adequate investment opportunities & a lack of rediscount able assets banks maintain large cash balances. As a result the central bank finds itself out of touch with the money market & the scope of bank rate is considerably reduced.